I had a really good week, and I don’t remember the last time I’ve said that with such enthusiasm when nothing super exciting happened. But I felt good, calm, happy and I had a realization that shifted how I look at my future. This realization has to do with comparison and goals. I get asked a lot about what my plans are for the next 5 or 10 years, but for the first time in my life, I don’t really have a solid answer. I’ve always had a big goal or next step in mind and, most recently, wanted to do everything from writing a book to starting a digital marketing consulting company, but over the last few months, as I’ve been able to see things more clearly, I come to terms with the fact that it’s ok to stick with what I’m doing now and not be stressing out about the next step and wanting more more more or bigger bigger and better better. My priorities at the moment, in this order, are 1. Being a good mother to Amalia (and wife to Anel), 2. Protecting my mental health, and 3. feeling fulfilled in my work. My career has always been important to me, and it still is, but right now I’m happy where I am. I’m not necessarily growing at the rate of my friends doing the same thing, and I can honestly say that I’m ok with that. I love my job, I love my relationships, I’m finally feeling happy and settled, and I want to spend the next year really focusing on appreciating that. That said, I do have some exciting work-related news which is that this weekend I’m hosting an event with J.Crew (eek!) in the city. I hope some of you New Yorkers can join me at J.Crew in Columbus Circle from 12-4pm on Saturday for sips, bites, a 30% discount on all warm-weather clothes, the re-opening of their crewcuts section, and to hang with me. You can RSVP here. I hope to see you there! It feels so surreal to be hosting something at the store where I shopped constantly when I lived in the city. It is a true a pinch-me moment. Scroll down for links around the web, some fun things (on sale!) to shop, and a Q&A that includes what perfume I wear, my top Trader Joe’s picks, my stance on immunization, and more. Does Netflix have a killer problem? I’ve watched most of the murderous shows and movies on Netflix, but hadn’t thought much about how our obsession with violence on TV is affecting our culture. My sister sent me this article and it definitely gave me some food for thought. My name in lights… Slash on a website. It was so exciting to see my guest room on the Joss & Main home page this week! You can shop all of the products on this page. And there’s my face. So cool! Thoughts on inclusive sizing. I’m beyond proud of my friend Grace and everything she has accomplished lately, including her recent blog content which has been incredible. Yesterday she wrote about inclusive sizing and it was quite eye-opening to read as a blogger myself. Breakfast blondies. I love me a good blondie… and not just because I’m blonde. I’m going to make these healthy(ish) breakfast blondies over the weekend as a good muffin alternative. They look delish! The best packable hat. I get asked about what sunhats are great for packing on vacation and I just got one that is perfect for summer travel. Currently reading. I’m almost done with this month’s Lemon Stripes book club pick, Bad Blood, and I’m so into the whole situation, I can’t even tell you. But I’m ready for some good fiction and I’m going to start Verity (based on recs from Bad on Paper) this weekend. Currently watching. One of my all-time favorite comedies, Catastrophe, is back on Amazon Prime for season 4. It got a bit dark at the end of season 3 and that continues this time around but I belly laugh out loud in every single episode. If you haven’t watched it yet, binge season 1 tonight (it flies by) and thank me later! Chic shower cap. I’ve been on the hunt for a chicer shower cap, and I finally found it here. I wash my hair every 2-3 days and need to cover it on the others. Anel makes fun of my granny shower caps, but now I’ll look tres cool. I also love this one on Amazon. Biggest wellness trends of 2019. Someone pass the CBD! Palm earrings. To go along perfectly with my current palm leaf obsession. FAQs on running a small business. My friend (and designer) wrote a super in-depth and interesting post about starting and running a small business. Pearl hair clips. All the bloggers are wearing them. But I’m pretty sure these are the most affordable pearl hair clips out there. I wore them in yesterday’s post and still can’t believe they’re only $2.60 for a three-pack! Speaking of hair accessories, how perfect is this $18 headband for summer? 1. Did you vaccinate Amalia? Yes. I do not judge other moms on anything pretty much ever (unless they’re hurting their child) because I truly believe that we’re all just doing our best, but please please please if you’re reading this, vaccinate your child. Little kids are literally dying because parents are believing false claims about vaccines. It’s tragic and irresponsible. On the same topic, I read this article yesterday which has more facts than I can give here. 2. 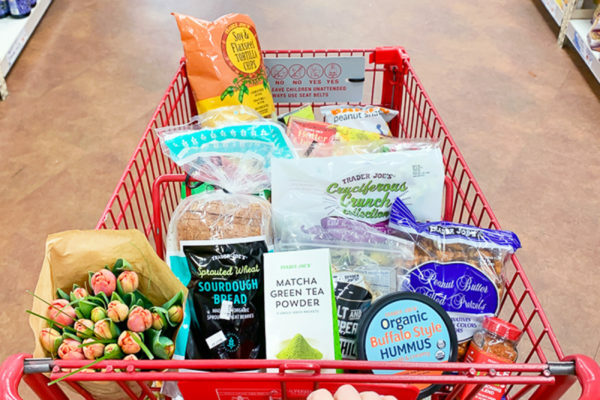 What are your Trader Joe’s favorites? OMG too many to name! Maybe we need a full post on this? I love their frozen Indian food, Bambas for snacking, frozen organic brown rice packets (so easy for quick dinners), ‘Cruciferous Crunch’ salad mix, ‘everything but the bagel’ seasoning, chili lime seasoning, white bean and basil hummus, sweet potato noodles, chia seeds (cheaper than anywhere else), salsa autentica (best salsa ever), cauliflower pizza crust, freeze-dried Fuji apples, multi-seed with soy sauce rice crackers, and the peanut butter filled pretzels. I’m sure I’m forgetting a bunch and now that I’ve written out that list I for sure will write a full post on this. 3. What perfume do you wear? I rotate between three scents: Diptyque Olene (jasmine), Le Labo Santal 33 (smokey and spicy), and Commodity Tea (clean and fresh). 4. What is your go-to breakfast recently? My medication makes me feel nauseous unless I eat bread in the morning so I’ve been having a piece of whole wheat sourdough toast with ghee, peanut butter, jam, and chia seeds with my Earl Grey tea. I used to be more into smoothies or eggs, but this is the only thing that keeps my stomach settled so I’m sticking to it. 5. What is your favorite stage, baby or toddler? Definitely toddler. I love being able to communicate with Amalia and laugh together. I feel a lot more connected to her now than I ever did when she was a baby. I also had pretty extreme anxiety for the baby days so that might be different the next time around, who knows! Thank you for mentioning vaccinations. I live in the metro Detroit area and we’re currently experiencing a measles outbreak. It’s absolutely terrifying. I have a 7 month old and we’re basically not leaving the house with her. It’s a pretty eye opening experience when it’s happening in your backyard. Please everyone vaccinate!! Agreed! Thank you for not being afraid to share your stance on vaccines, given the backlash that some people get from anti-vaxxers. It infuriates me that people don’t vaccinate their kids and put young babies, in particular, at risk. That is so scary, Stacey. I’m so sorry you have to go through that. No mother should have to feel that fear in this day and age! Oh man Verity was hard for me as a mom to read & finish. But it was so good. Reading it I almost felt guilty – like I was allowing the things to happen in the book. I won’t spoil the book but I’m curious to hear what you think. I’m so scared to even start it, so many moms are telling me this! 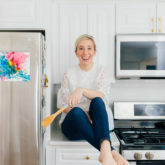 Love Life Lately Posts ! That skirt you are wearing is gorgeous ! Glad to hear that you are settled and at peace with your life. 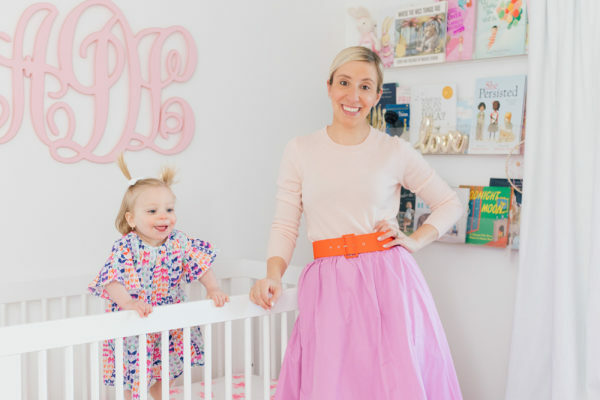 That peony ball skirt is gorgeous on you! Today’s photos literally pop off the screen! Thank you for the Catastrophe shoutout! Absolutely LOVED that show, and am bummed that they may not be filming Season 5! The BEST show ever and I’m so bummed it’s not coming back. I’m going to rewatch the whole thing (for the third time) though… That’s how much I love it. I must say that my husband and I make a beeline to Trader Joe’s at least once a week. There are so many things that we love from there. Fresh blueberries, jicama sticks, dried cherries are just a few of the items that we usually walk out of the store with. We feel that the employees are so kind there too and seem to truly enjoy working there. The employees are SO nice and always smiling. That’s my favorite part about going there! I absolutely love the article you linked to from Grace about inclusive sizing. I would love to know if you have thought about expanding your own site to include more plus size options. I adore your style and I would love to be able to wear more pieces myself! Maybe you could even speak to Dudley Stephens or Persifor to make larger sizes! I appreciate that you touched on this, but I would like to hear more about your own thoughts. Thank you! I am honestly so ashamed to admit that it isn’t something that was really on my radar before this but I will talk to Persifor and DS about it literally today. I guess I haven’t thought about it enough and I don’t really know enough to say anything on the topic but I do feel bad that I haven’t been more inclusive, it wasn’t on purpose. I will be more aware going forward I hope! Hi Susan! I just wanted to update you on my conversations with Dudley and Persifor. I hope this is helpful. From Dudley Stephens: We have XXL in all styles which covers up to size 20! We make just as many of those as we do the smaller sizes. I really appreciate the follow up! I love your blog and your sweet family. Would love to read a Trader Joe’s post- always looking for new ideas! Also this may be too personal so feel free to ignore/not answer, but for a future Q&A (or here) I was wondering if you have a had a lot of side effects from your medication. I am also a longtime anxiety sufferer who is looking into going on medication- the main thing holding me back is I am really nervous about the side effects and not feeling well. I know everyone’s experience is different, but your post was one of the catalysts for me deciding to finally look into taking this step so I was just curious about this aspect. Just want to say that I agree on vaccines, but wanted to add that my pediatrician talked through it with me and suggested that we do a delayed schedule so there weren’t so many given at one time. There are lots of options and if you have a good doc they will hear your concerns and help you make sense of it all. We just spaced it out in a way that felt better to me and it was all done by the time it mattered. Just a little extra info! Your roundups are always a treat. Love that you’re feeling content with where things are in your career. As a follower may I say — it shows! Your blog is so you and such a delight — and invaluable resource! — to consume. Thank you for sharing it! I am going to try and make it to your J. Crew event!!! And yes, I think a dedicated Trader Joe’s post would be perfect because I also have a TJ’s obsession, and love to see what other people’s faves are!! Have a great weekend, Julia, I hope to see you on Saturday!! I would LOVE to meet you in person. I hope you can make it! I have about 15 pages left in Verity & might just close my office door to “take a call” and finish it, so good! Definitely want to start Bad Blood next, its so fascinating! That WaPo story about violence on Netflix is resonating with me. I too have gotten obsessed with Making a Murderer, The Staircase, The Keepers, and Serial (now a 4-part series on HBO). My daytime brain is obsessed with the legal loopholes and criminal rights details, but my nighttime brain goes haywire… every time I’m deep into watching these shows, I have scary dreams about dead bodies, men stalking me, violence, and murder. My dreams keep me up at night because my brain can’t stop thinking about the gory details–super weird how our brains digest these things! Once I finish The Case Against Adnan Syed on HBO, I’m going to take a break from these shows and podcasts for awhile–even though my analytical brain craves the mystery and legal analysis. I’m the exact same way with the scary dreams. I had to take a break and it’s made a huge difference. I recommend Catastrophe in the meantime for something light, funny, but also addictive. I think you have a lot of insight on where you’re going the rest of this year, and I’d say you’re off to a wonderful start! Girl, yes to vaccines! I know a little boy and for medical reasons he cannot be vaccinated against certain things and his mom is a wreck. We are just trying to do our best!